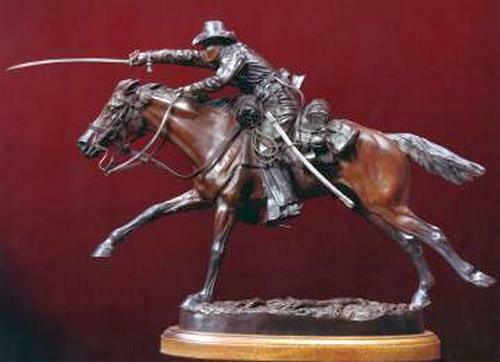 "In Tierce Point" is the primary sabre position for a cavalry charge. The U.S. trooper depicted for the early 1860's is armed with the M1840 "Heavy Dragoon" sabre ("old wrist breaker")as his regiment has not yet received the newer M1860 "Light Cavalry" sabre. He also carries a M 1860 Colt .44 cal. "Army" revolver and a .52 cal. M1859 Sharps carbine. Twenty carbine rounds are carried in the box on his sabre belt with caps in the smaller box in front. He is wearing the trimmed "Hardee" hat pinned up in cavalry fashion, a yellow-trimmed shell jacket with 5 year service stripe, reinforced mounted trousers (sky blue)and brogan shoes. The saddle is the M1859 McClellan with crupper and saddle "pockets" (bags.) His sky-blue overcoat is rolled on the pommel; a grey bed blanket rolled in his black rubberized poncho on the cantle. Nose bag, canteen, haversack with rations, tin dipper and lariat with picket pin completed the accoutrements. He is "regulation" either serving on the frontier or "back east" in the war.